Simplify your Wi-Fi with the Orbi Wireless Router AC2200 Tri-Band Wi-Fi System from Netgear. This Wi-Fi system consists of the Orbi Router and two Orbi Wall Plug Satellites designed to work together to expand Wi-Fi coverage by up to 5,000 square feet. The Orbi Router comes equipped with two Gigabit Ethernet network ports, one of which is designated a WAN port and the other is designated a LAN port. The Orbi Satellites do not come with any network ports, instead they feature enhanced 802.11ac Wi-Fi connectivity with data transfer rates of up to 2200 Mb/s at distances of up to 1500 square feet. These powerful Orbi devices make it easy expand the reach of your existing wireless network, and you can also connect a variety of Ethernet-enabled devices to the network as well. 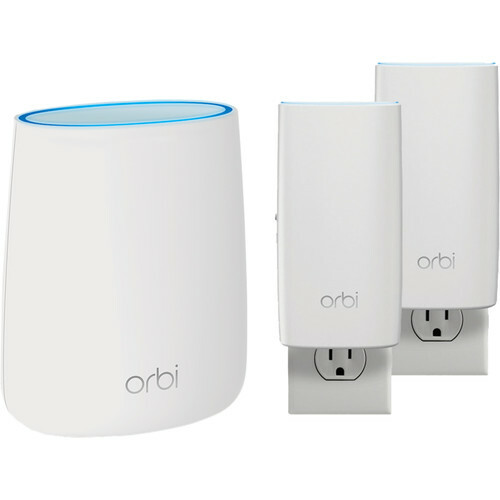 Once configured, the Orbi Wi-Fi system provides comprehensive wireless network access and operates on both the 2.4 GHz and 5 GHz frequencies supporting tri-band functionality to handle a greater number of connections. Additionally, these routers support the 802.11ac Wi-Fi standard and offer enhanced wireless data transfer rates of up to 2200 Mb/s. To further enhance wireless connections these Netgear routers utilize both beamforming and MU-MIMO technologies to provide a more directed signal to multiple devices all at the same time. This Orbi Whole Home Wi-Fi System (RBK23W) covers homes up to 5000 square feet with up to 2.2 Gb/s combined Wi-Fi speeds. Includes an Orbi Wi-Fi Router and two Wall Plug Satellites and replaces your home router and extenders. Innovative Tri-band Wi-Fi helps maximize the internet speeds available in your home, even as more devices connect. Easily works with existing service provider equipment. Enjoy high-speed Wi-Fi in every corner of your home. In a hallway or kitchen, garage or basement, the Wall Plug Satellite only needs an electrical outlet to deliver great Wi-Fi. Easily extend Wi-Fi coverage to every room of your house. Box Dimensions (LxWxH) 10.6 x 7.0 x 7.0"